Social media has found a new celebrity. Ashton Kutcher and Twitter, please step aside. Kanye and your blog, too. Food is the latest starlet, and it is driving online conversations--as well as the technology that records them. To give a sense of the growing presence of food in our wired lives, here are a few impressive facts. 1) Since 2008, the number of photos on Flickr tagged as "food" has increased ten-fold to more than six million. 2) The most active Flickr photo group, "I Ate This" has more than 300, 000 photos that have been contributed by more than 19,000 members. 3) Nikon, Olympus, Sony, and Fuji now all make cameras with "food" or "cuisine" modes, which allow for up-close shots with enhanced sharpness and color and texture saturation. 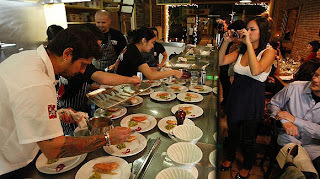 4) Grant Achatz of Alinea, Chicago, says that, on average, diners who take snapshots of their food take five minutes longer per course. 5) One of the hottest sites at this year's South by Southwest Interactive conference was Foodspotting.com, a website and mobile app, that allow users to exchange and rate food photos much like the social media site, Foursquare. So confession time: How many of you snap shots of your meals? I love taking photos of a well prepared meal.